West Point A Familiar Setting For Obama War Speech A presidential speech at West Point — the oldest of the service academies — carries a certain weight. It puts the focus on the role of commander in chief in a special way. Seven and a half years ago, President Bush used the venue to present an optimistic view of progress in Afghanistan and to introduce his "war on terror." 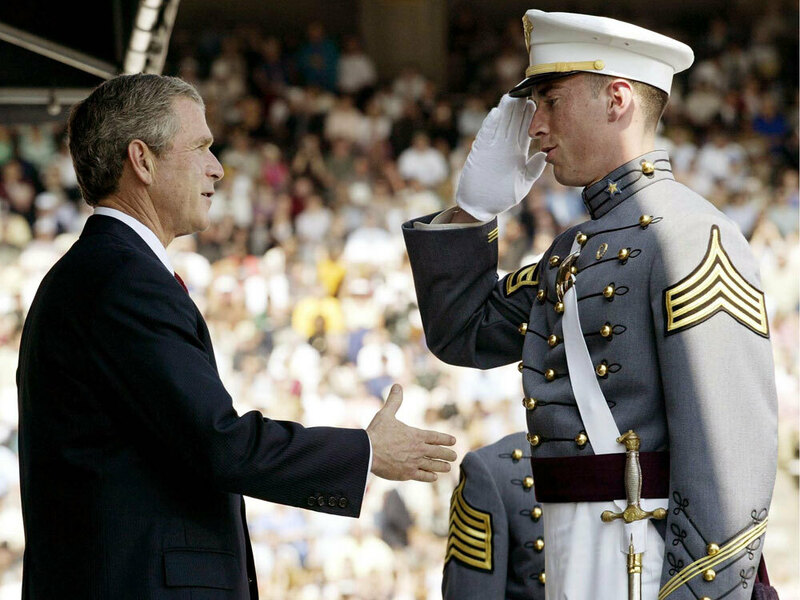 President George W. Bush congratulates graduate Matthew Nethers at the commencement ceremony at the U.S. Military Academy at West Point in New York on June, 1, 2002. President Obama is expected to announce plans Tuesday night to send more troops to Afghanistan in a speech at the U.S. Military Academy at West Point, N.Y. Seven and a half years ago, his predecessor used the academy to present an optimistic view of progress in Afghanistan and to introduce a new approach to warfare and confronting national security threats in general: the "war on terror." A presidential speech at West Point — the oldest of the service academies — carries a certain weight. It puts the focus on the role of commander in chief in a special way. Every president who goes there pays tribute to its long history and many traditions, just as George W. Bush did on June 1, 2002. "In every corner of America, the words 'West Point' command immediate respect," he told the graduating class. "This place where the Hudson River bends is more than a fine institution of learning." Read a transcript and listen to audio from the former president's speech to the graduating class at West Point. As he spoke to the cadets, Bush was upbeat about the war in Afghanistan, launched just weeks after the Sept. 11 attacks the previous year. "Our war on terror is only begun, but in Afghanistan it was begun well," he said. Political scientist and military specialist John Mearsheimer of the University of Chicago says it was a widespread and reasonable view at the time. And because the Afghanistan war was seen as going so well, he says, the Bush administration already had begun to shift its attention to the next war — with Iraq. "At that point in time," Mearsheimer says, "[the Bush administration] felt that it had won a stunning victory in Afghanistan, and it had, in effect, found the magic formula for winning wars against countries in the Middle East, and therefore it was 'on to Iraq,' where they believed we would win another stunning victory." But, Mearsheimer, himself a West Point graduate, immediately adds what we all know now: "Of course, not only did the war in Afghanistan go south, but we jumped into a quagmire in Iraq." During his speech at West Point in 2002, Bush also introduced what would later be known as "the Bush doctrine": the assertion that the U.S. can launch preemptive war against a country, such as Iraq, that is perceived to be threatening the U.S., even if that threat is not believed to be immediate. "If we wait for threats to fully materialize, we will have waited too long," he said. And as he spoke, he used the word "preemptive" for the first time in a major speech. "And our security will require all Americans to be forward-looking and resolute, to be ready for preemptive action when necessary to defend our liberty and to defend our lives," he said. All through last year's campaign, President Obama was critical of the Bush doctrine. As president, Obama often calls Iraq a war of choice. Still, he has yet to lay out his own national security strategy, which is expected to come following a quadrennial review of military posture currently under way at the Pentagon. On Tuesday night, more than seven years after Bush's positive assessment of Afghanistan, Obama faces a much more difficult situation there. His own commanding general has told him the U.S. strategy there is failing. The new president may have inherited the war, but the choices he announces at West Point will make it his own. New polling released this week shows slightly more than half of the American public now opposes the war in Afghanistan, weary of a battle they thought would be over years ago.